These sleeping bags are finally real. When ThinkGeek's Tauntaun sleeping bag debuted last year as an April Fool's joke, a million voices cried out demanding it be made. The company picked up on this disturbance and, now, you can finally preorder your very own alien kangaroo Snuggie for $100. This high-quality sleeping bag looks just like a Tauntaun, complete with saddle, printed internal intestines, and a plush lightsaber zipper pull. Now when your kids tell you their favorite Star Wars movie is "Attack of the Clones" you can nestle the wee-ones snug in simulated Tauntaun fur while regaling them with the amazing tale of "Empire Strikes Back". The zipper pull is a lightsaber! You can gut this Tauntaun just like in the film. Let's hope it doesn't smell worse on the inside because, really, just wash the damn thing. 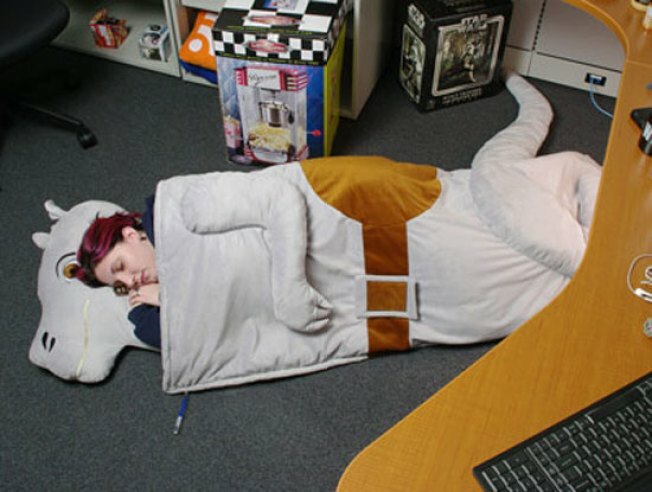 The Tauntaun sleeping bag is due out at the end of this month, right in time for the holiday season. Check out ThinkGeek's epic promo video down below.